Carbon dioxide-rich fluid and carbonate-rich aluminosilicate melt inclusions in tantalite-(Mn) from the Alto do Giz pegmatite in the Borborema Pegmatite Province, northeastern Brazil were investigated to constrain the formation of the host crystals. The results demonstrate that in the Alto do Giz pegmatite, water- and alkaline carbonate-rich fluids and melts are responsible for the transport and deposition of tantalite-(Mn) at temperatures around 600°C and about 4 kbar. Moreover, evidence is presented to show that during crystallization of the tantalite- (Mn), three different components coexisted, which are now trapped as separate inclusions: two immiscible silicate melts (types A and B melt inclusions) and a CO2-rich aqueous fluid. We hypothesize that immiscible fluid separation may have been a critical factor in producing the water- and alkaline carbonate-rich fluids and melts necessary for Ta and Nb transport. 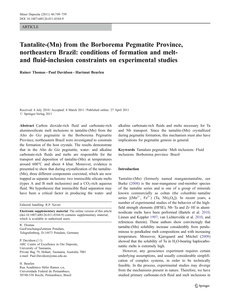 Since the tantalite-(Mn) crystallized during pegmatite formation, this mechanism must also have implications for pegmatite genesis in general.